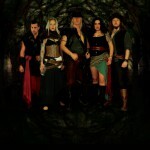 Saor Patrol and The Dolmen are both well-established bands playing their own style of rebel folk rock. On this album they collaborate. Review of the album ‘Where the Wind Blows’ by Harmony Glen.